First came Malcolm in the Middle and then the incredible success of Breaking Bad. Having uncovered the secret to success in middle-age, Bryan Cranston is riding high – conquering the small and silver screen. Now he’s returning to the stage in an adaptation of the quadruple Academy Award-winning 1976 film Network, which runs at the Lyttelton Theatre from early November. It’s been quite the time for Bryan Cranston these past two decades. After 30 odd years of standing in the wings, an early career made up mostly of bit parts, the man who made his name as neurotic patriarch Hal on the long-running family sitcom Malcolm in the Middle finally had his undeniable talents uncovered courtesy of the uber-successful crime drama Breaking Bad. 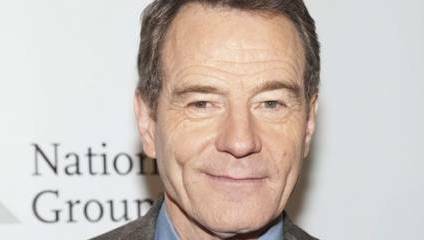 Although his stint as narcotics kingpin Walter White may have cemented Cranston’s reputation, the acclaimed actor wasn’t about to rest on his laurels. A starring turn on the silver screen in Trumbo as the 1940s screenwriter and novelist Dalton Trumbo, who was blacklisted for his political beliefs, accrued Cranston further plaudits; now the actor is returning to the stage from November 4th for his UK debut as the lead in Ivo van Hove’s Lyttelton Theatre adaptation of the four-time Oscar-winning 1976 film Network. Famed for its lead’s iconic “I’m as mad as hell” rant, Network details the psychological unravelling of an anchor-man – played by Cranston, succeeding Peter Finch in the original film – which leads to him becoming a populist TV star. And as Cranston prepares to tread the boards once again – he earned a Tony Award for his Broadway performance as President Lyndon B. Johnson in 2014’s All the Way – it’s almost inconceivable to think that his first cinematic starring role came a year after that Stateside success. “I’ve been very fortunate and I feel very grateful,” he nods. “It took me a long time to reach this point, but in a way, it’s more satisfying because I was always in this for the long haul. I always loved acting and I was willing to wait and pursue my passion for as long as I could find work and feed my family. But the man himself remains humble as ever in spite of the many directors of both stage and screen productions clamouring for his signature; he hopes future stars can view his long wait for recognition as a positive trait. “It’s not necessarily unsettling; it’s surprising,” he says. “I didn’t have any designs on where it was going to end up – where do I want to be? Where do I hope to be? I’m going to do this, I’m going to do that. That all seemed to be everything but the work. Whenever I can teach young actors now, I tell them: ‘don’t focus on that’. Bryan Cranston appears in Network at the Lyttleton Theatre, from November 4th. Read our interview with his co-star Michelle Dockery here.